Today, the Azure team is proud to announce a new member to the Azure Stack family, the Azure Stack HCI solutions. Azure Stack HCI is Microsoft’s hyper-converged solution available from a wide range of hardware partners. Azure Stack shipped in 2017, and it is the only solution in the market today for customers to run cloud applications using consistent IaaS and PaaS services across public cloud, on-premises, and in disconnected environments. With adding the Azure Stack HCI solutions, Microsoft is offering customers a great new choice for their traditional virtualized workloads. It is built on a hyper-converged Windows Server 2019 cluster that uses validated and certified hardware to run virtual machines and workloads on-premises. Azure Stack HCI also allows you to optionally connect Azure services for BCDR, management and more. Azure Stack HCI solutions use Microsoft-validated hardware to ensure optimal performance and reliability. It includes support for technologies such as NVMe drives, persistent memory, and remote-direct memory access (RDMA) networking, to get the best possible performance if needed. 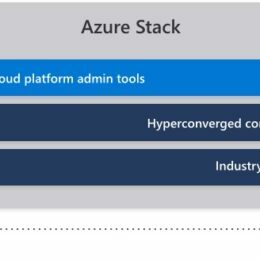 Azure Stack HCI is based on Windows Server 2019, parried with validated hardware from OEM partners. With the Windows Server 2019 Datacenter edition, customer get Software Defined Infrastructure and Software Defined Datacenter technologies like Hyper-V, Storage Spaces Direct and many more, which are the base of Azure Stack HCI. Paired with Windows Admin Center, you can use existing skills, gain hyperconverged efficiency, and connect to Azure services. A while ago Microsoft announced the next key versions Windows Server 2019 and System Center 2019. And a couple of weeks ago, at the Windows Server Summit, Microsoft was taking more about what is new in Windows Server 2019. Microsoft also talked a lot about the positioning of Windows Server and what we can expect in the future. With the news finally released to the public, I can start talking and blogging about the new features and investments. 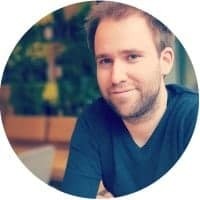 I decided to create a series of blogs, to show the world the great new features. This blog post here, should give you a high level overview about how Microsoft is investing in Windows Server 2019. Windows Server is not only powering the Intelligent Edge where you have a great Software-Defined Datacenter plaform running Hyper-V or Stroage Spaces Direct, or as application platform. It is also powering the Microsoft Azure Intelligent Cloud. Windows Server is running the foundation of the platform of Azure and also many many services running in Microsoft Azure and Microsoft Azure Stack. 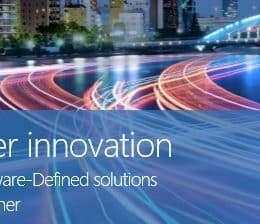 If the innovation happening in the Microsoft Public Cloud, we as customers also benefit from that. Windows Server is a great platform and it runs where ever you are. 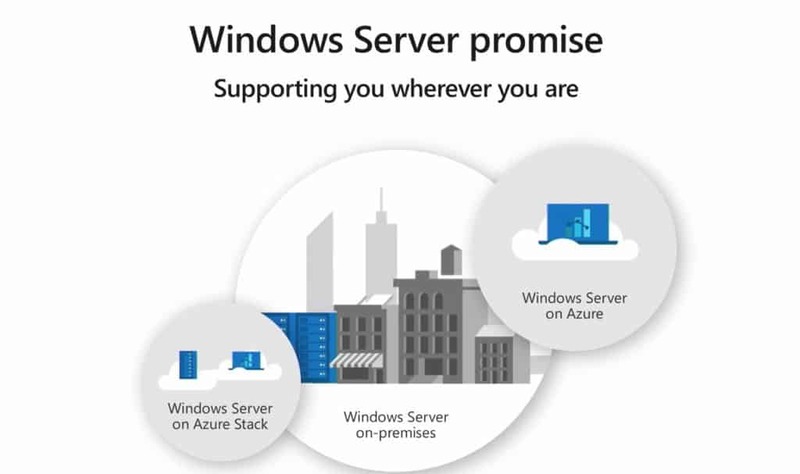 If you run on-premises in your Software-Defined Datacenter running in on physical hardware or in virtual machines or on Azure Stack, Windows Server is your platform. If you are running in the Public Cloud, Windows Server is not only the platform powering Azure. Windows Server is also a great platform for you to run application in Microsoft Azure or other cloud services providers. 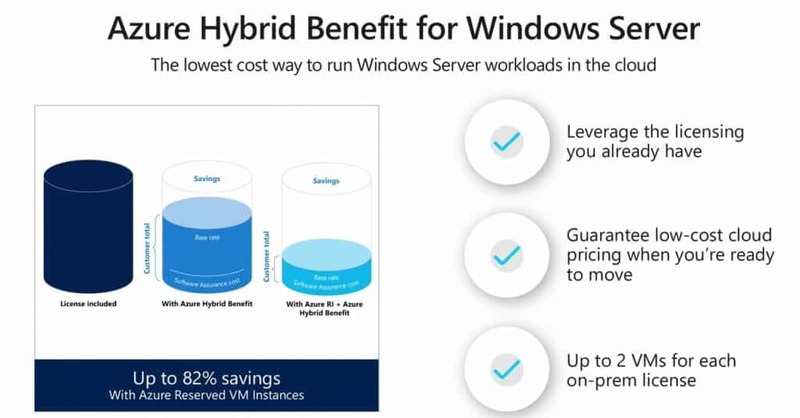 The Azure Hybrid Benefit for Windows Server is also a great option to run Windows Server workloads in the cloud. It allows customer to leverage the licensing they already have. This can bring down cost by a huge factor, and this together with Azure Reserved VM Instances up to 82%. 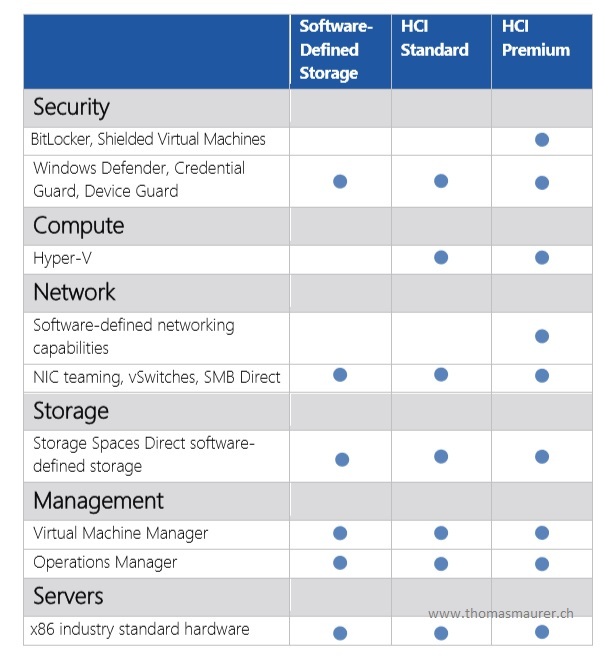 If we have a look at the investments done in Windows Server 2019, we can see that we can categorize them in 4 categories. Windows Server 2019 brings new functionality and features to extend your datacenter to Azure to maximize existing investments and gain new hybrid capabilities. To achieve this Microsoft brings improvements to Windows Server 2019 like built-in Azure Active Directory integration, Azure Backup, Azure Site Recovery, Storage Migration Services and many more. One of the key factors in today’s IT landscape is security. Microsoft started the journey by bringing enhanced security features to Windows Server 2016. With Windows Server 2019 Microsoft improves these security features of their server operating system. Microsoft adds new capabilities like Shield Virtual Machines for Linux, Exploit Guard, Encrypted Virtual Networks and under a lot of others. My favorite, the integration of Windows Defender Advanced Thread Protection or Windows Defender ATP. With the Semi-Annual Channel releases of Windows Server, Microsoft already released some great investments to enable developers and IT pros. These allow them to create cloud native apps or modernize their traditional apps using containers and micro-services. In Windows Server 2019, Microsoft goes one step further and releases the SAC Improvement s like Linux Containers on Windows Server and the Windows Subsystem for Linux on Windows Server to the LTSC release. Microsoft also invest heavily to improve the container experience on Windows Server, by optimizing the container images for Server Core and Nano Server, a new Windows Container Image and better integration into orchestrators like Kubernetes and Service Fabric. Microsoft is also improving your software-defined datacenter experience to achieve greater efficiency and security. 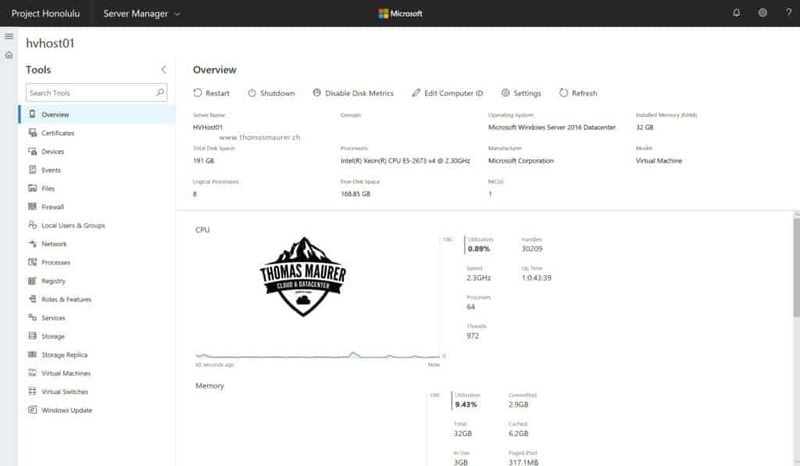 With Windows Admin Center, Microsoft introduced a new web-based management UI which will be a perfect solution to manage your Windows Server 2019 servers. However, Microsoft is also investing in more hardware support like Storage Class Memory support. But also, on adding scale, resilience and performance improvements to your Storage Spaces Direct deployments. This includes improvements like Cluster Sets, improved performance for Mirror-accelerated parity volumes and much more. Back in September Microsoft released Project Honolulu, which is the codename for a new Windows Server management experience. Today Microsoft announced the Windows Admin Center. Windows Admin Center is a flexible, locally deployed, browser-based management platform and tools to manage Windows Server locally and remote. 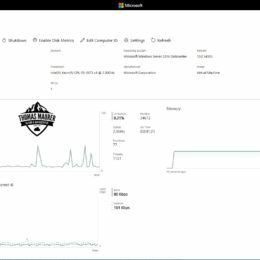 Windows Admin Center (WAC) gives IT Admins full control over all aspects of their Server infrastructure and is particularly useful for management on private networks that are not connected to the Internet. I had the chance to test and work with Windows Admin Center for a while in a private preview program. This give me the chance to test and work with WAC for quite some time. Windows Admin Center is the modern evolution of the “in-box” management tools of Windows Server, like Server Manager, MMC, and many others. It is complementary to other Microsoft Management solutions such as System Center and Operations Management Suite. And as Microsoft clearly states, WAC is not designed to replace these products and services. WAC is a replacement for the local only tools and is especially handy if you run Windows Server Core. Windows Admin Center also became the management user interface for the Azure Stack HCI solutions. You might remember the Azure Server Management Tools (SMT). 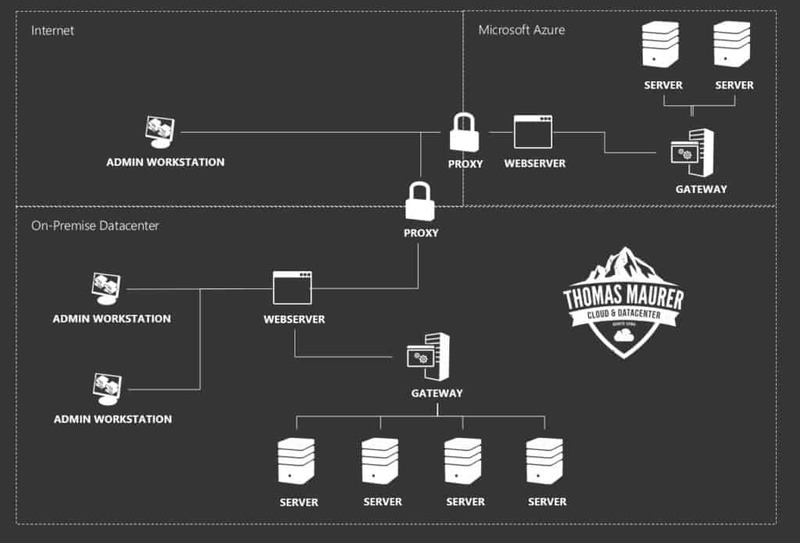 SMT were management tools hosted in Azure and allowed you to manage your servers in the cloud and on-primes. Basically, a hosted services of Windows Admin Center. The feedback however was, that a lot of customer preferred a on-premise solution for their management experience. Microsoft took that feedback and created Windows Admin Center formally known as Project Honolulu. Simplified server management – WAC consolidates many distinct tools into one clean and simple web interface. Rather switching between different tools, you can final everything in one place. Illuminate your datacenter infrastructure – With WAC you can manage Windows Server 2016, 2012/2012 R2, Hyper-V Server 2012 and higher. WAC not only allows you to manage standalone servers, but also complete solutions such a failover clusters, hyper-converged clusters based on Storage Spaces Direct and much more. And I am sure you can bet it will also support Windows Server 2019 when it arrives. The tools you know, reimagined – Windows Admin Center provides the core familiar tools you have used in the past. Manage Hyper-Converged Infrastructure – WAC brings solutions to manage your Hyper-Converged systems. You get a single pane of glass to manage and operate your Storage Spaces Direct Clusters. You can easily get an overview about resources, performance, health and alerts. Extend your on-prem environment with Azure Hybrid Services – Windows Admin Center lets you easily extend our on-premises environment, or an environment hosted on another cloud platform with Azure services. 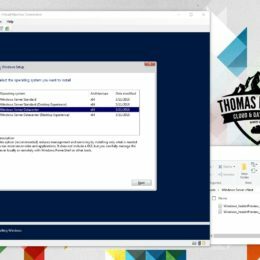 I have created a short video series which shows how to setup the Azure Hybrid services directly from Windows Admin Center. You can start with the intro here and then follow the different videos, and check out our overview blog about Configure Azure Hybrid Services in Windows Admin Center. WAC has different solutions which give you different functionality. In the technical preview there are three solutions available, Server Manager, Failover Cluster Manager and Hyper-Converged Cluster Manager. The server manager lets you is kind of like the Server Manager you know from Windows Server, but it also replaces some local only tools like Network Management, Process, Device Manger, Certificate and User Management, Windows Update and so on. The Server Manager Solution also adds management of Virtual Machines, Virtual Switches and Storage Replica. 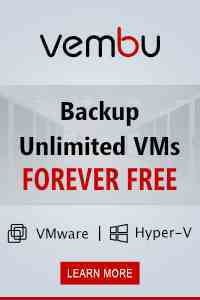 As you might think, this allows you to manage Failover Clusters. The Hyper-Converged Cluster Manager is very interesting if you are running Storage Spaces Direct clusters in a Hyper-Converged design, where Hyper-V Virtual Machines run on the same hosts. This allows you to do management of the S2D cluster as well as some performance metrics. WAC can be deployed in several different ways, depending on your needs. Windows Admin Center leverages a three-tier architecture, a web server displaying web UI using HTML, a gateway service and the managed nodes. 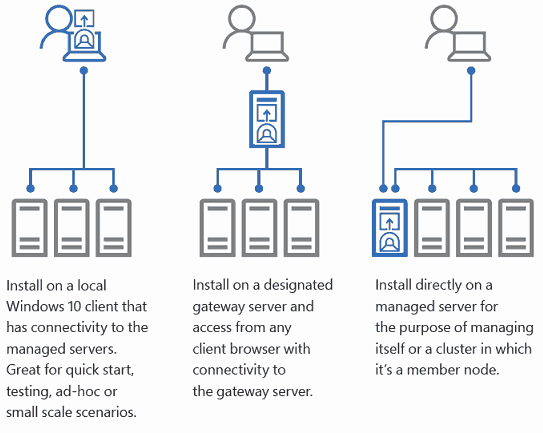 The web interface talks to the gateway service using REST APIs and the gateway connected to the managed nodes using WinRM and PowerShell remoting (Similar like the Azure Management Tools). You can basically access the Web UI from every machine running modern browsers like Microsoft Edge or Google Chrome. If you publish the webserver to the internet, you can also manage it remotely from everywhere. 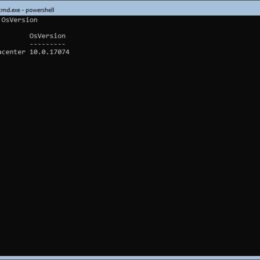 The installation and configuration of Windows Admin Center is straight forward and very simple. In Project Honolulu during the preview time, one of the missing pieces was the missing RBAC (Role-Based Access Control). Windows Admin Center now comes with RBAC so you can configure it for your needs. 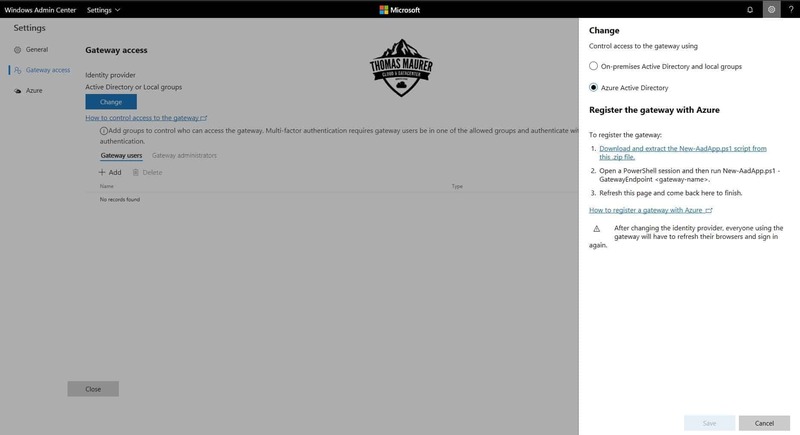 Also new is the possibility to use Azure Active Directory as a Identity Provider. In this case you can use your Azure AD users and groups to access the Windows Admin Center. In my opinion Windows Admin Center provides us with the Windows Server management tools we were looking for. It helps us to manage our systems form a centralized, modern HTML5 web application and makes managing GUI-less servers easy. I still think the Server Management Tools hosted in Azure were a better overall solution. Since we only needed to deploy a gateway in our datacenter and we could access and manage our systems from the Azure portal. However, a lot of customers didn’t like the dependency on the cloud, so the Windows Admin Center makes perfect sense as a on-premise solutions with the option to extend the on-prem environment with Azure. The possibility to extend it with solutions and extensions form third parties makes it even better. You can download Windows Admin Center here. Microsoft today announced the next Long-Term Servicing Channel (LTSC) release for Windows Server called Windows Server 2019. 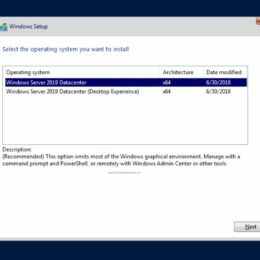 In a blog post today, Erin Chapple, Director of Program Management Windows Server, announced the Windows Server 2019, which will be available in the second half of calendar year 2018. You can try out a Windows Server Preview build through the Windows Server Insider Program today. Microsoft also mentions that System Center 2019 will be available to manage Windows Server 2019 infrastructures. 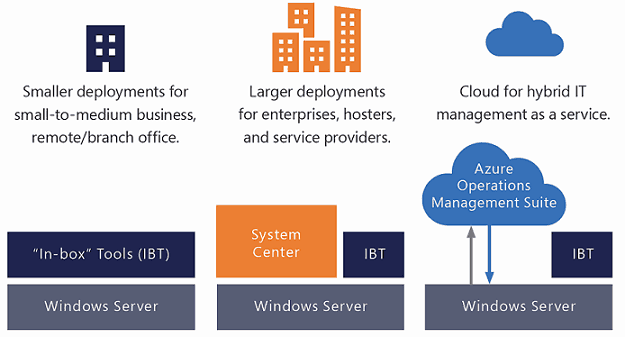 Windows Server 2019 is built on the foundation of Windows Server 2016 and focuses on a couple of key scenarios. Microsoft in four key areas, Hybrid Cloud, Security, Application Platform and Hyper-Converged Infrastructure (HCI). As of today Hybrid Cloud is more real than ever. With Windows Server 2019 Microsoft is focusing to improve the customer experience in a hybrid cloud world. 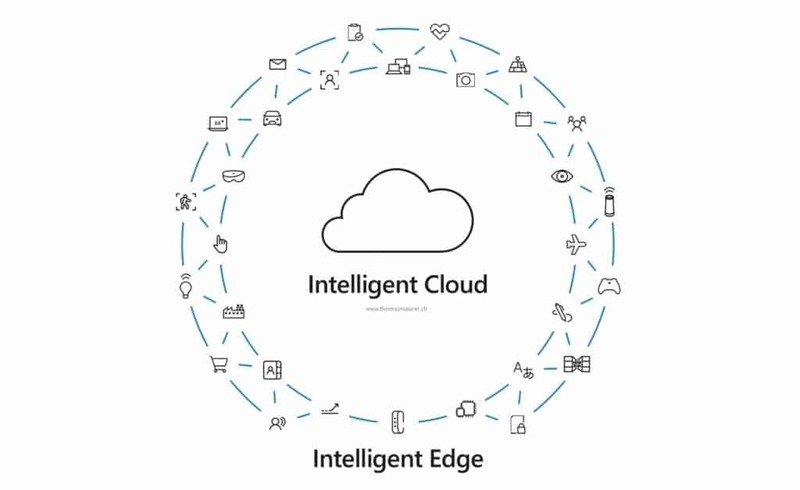 Taking advantage of public cloud innovation such as Artificial Intelligence and IoT, and connecting them with on-premise services is a huge enabler for customers. At Microsoft Ignite 2017, Microsoft showed of the Technical Preview of Project Honolulu, a web-based management console for Windows Server. One of the goals of Project Honolulu is to connect Windows Server deployments with Azure services. Together with Windows Server 2019 and Project Honolulu, you can easily integrate services like Azure Backup, Azure File Sync, Azure Site Recovery and much more. Security was already one of the big investments in Windows Server 2016. Microsoft does not stop there. With Windows Server 2019 Microsoft brings various security improvements like Shielded Virtual Machine support for Linux VMs and Encrypted Virtual Networks. One of my favorite improvements is the possibility to integrate with Windows Defender Advanced Thread Protection (ATP). ATP was first available for Windows 10 and provides preventative protection, detects attacks and zero-day exploits among other capabilities, into the operating system. This gives customers access to deep kernel and memory sensors, improving performance and anti-tampering, and enabling response actions on server machines. One of the key focus of Microsoft for Windows Server, was always on the developer experience. Microsoft brings a couple of improvements to make it the best application platform out there. 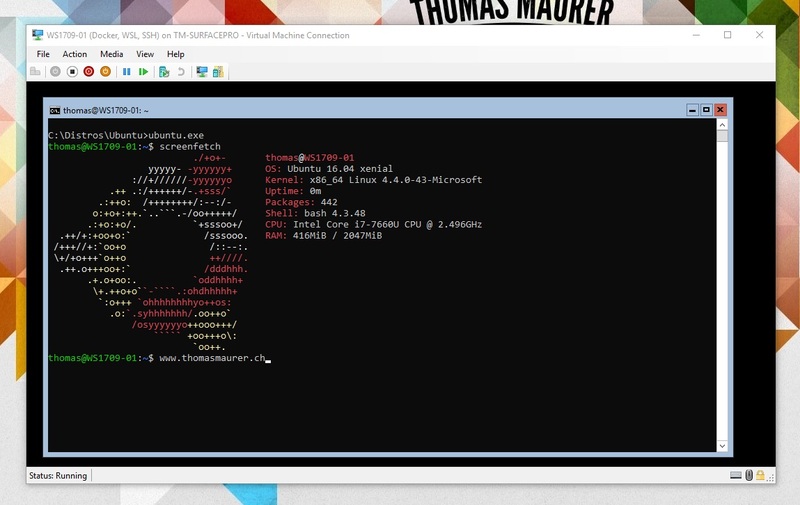 Microsoft invests in a couple of scenarios such as bringing the Windows Subsystem for Linux (WSL) to Windows Server. Another key investment area are Windows Server Containers and Windows Server Container images. In Windows Server 2019, Microsoft reduces the Server Core base container image to a third of its current size of 5 GB. This will reduce download time of the image by 72%, further optimizing the development time and performance. Another key improvement in terms of Container support is the integration and support for Container orchestrators like Kubernetes. The 4th improvement area is the Hyper-converged infrastructure (HCI). With Windows Server 2016 Microsoft released a new feature called Storage Spaces Direct. Together with Hyper-V and other Microsoft technologies, this was great to build you own infrastructure for your virtualization workloads. Windows Server 2019 will bring a lot of improvements for Storage Spaces Direct, Hyper-V and other related technologies. Microsoft is adding scale, performance, and reliability to the platform. Microsoft also partnered with hardware vendors to provide an affordable and yet extremely robust HCI solution with validated design. Windows Server will be GA (generally available) in the second half of calendar year 2018. Windows Server will be a LTSC release. LTSC will be the recommended version of Windows Server for most infrastructure scenarios and workloads like SQL Server, SharePoint and Windows Server Software-Defined Datacenter solutions. With the LTSC release of Windows Server 2019, Microsoft will allow customers to use the Server with Desktop Experience as well as Windows Server Core. With the Semi-Annual Channel (SAC) release, Microsoft only provides the Windows Server Core option. There will be another Semi-Annual Channel (SAC) release at the same time as Windows Server 2019 focusing on Container innovations. The SAC releases will be supported as before for 18 months, while the LTSC releases follow the normal 5+5 year support. Licensing will use the same model as Windows Server 2016 today, Microsoft mentions that it is likely that they will increase the pricing for Windows Sevrer Client Access Licensing (CAL), but will share more details later. With that we can all be very excited for the next LTSC version of Windows Server. Until then the next SAC release of Windows Server, called Windows Server 1803, will be available this spring. The Windows Server, version 1803 will focus on container improvements. If you want to try out, Windows Server 2019 or Windows Server 1803, you can join the Windows Server Insider Program. This summer I took the Microsoft beta exam 70-745 Implementing a Software-Defined Datacenter, which focuses on implementing Software-Defined Datacenter solutions, based on Hyper-V, Windows Server, Software Defined Networking and Storage, System Center Virtual Machine Manager, System Center Operations Manager and everything around it. 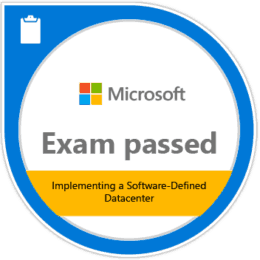 Passing Exam 745: Implementing a Software-Defined Datacenter validates the skills and knowledge to implement a software-defined datacenter (SDDC) with Windows Server 2016 and Microsoft System Center 2016 Virtual Machine Manager (SCVMM). Candidates have experience implementing and managing highly available SCVMM infrastructures as well as implementing software-defined storage, compute, and networking components. This week I finally got the message that I passed the Beta exam. If you want to take that exam you should really be familiar with the products and solutions mentioned above, otherwise you will have a hard time passing the exam. Also big congrats to all the others who passed the exam like Charbel Nemnom. I am sure you have heard already about the great new improvements of Windows Server 2016 which launched almost a year ago. 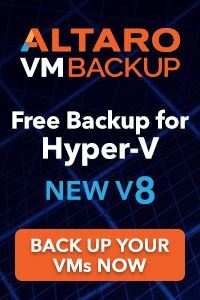 Especially features like Hyper-V, Storage Spaces Direct, Storage Replica and the Software-Defined Networking part got some great updates and new features. Windows Server delivers a great foundation for your Software-Defined Datacenter. The Windows Server Software-Defined Datacenter (WSSD) program is specifically designed to make even more out of it. Compute – Hyper-V delivers a highly scalable, resilient and secure virtualization platform. However, deploying a Software-Defined Datacenter can be challenging and expensive. The Microsoft Software-Defined Datacenter certification allows you to simplify deployment and operations with a certified partner solutions. I have worked on a couple of deployments and building complex solutions can be expensive and time consuming. The Microsoft Software-Defined Datacenter certification allows you to have a pre-validated solution which result in faster deployment times, accelerated the time to value, a more reliable solution and optimized performance. Microsoft is working with different partners like DataOn, Dell EMC, Fujitsu, HPE, Lenovo, Quanta (QCT) and SuperMicro to deliver these solutions. Partners offer an array of Windows Server Software-Defined (WSSD) solutions that work with Window Server 2016 to deliver high-performance storage or hyper-converged infrastructure. 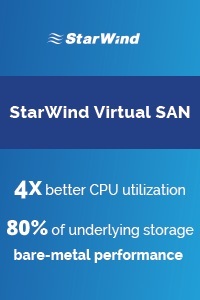 Hyper-converged solutions bring together compute, storage, and networking on industry-standard servers and components, which means organizations can gain improved datacenter intelligence and control while avoiding the costs of specialized high-end hardware. Software Defined Storage (SDS) – Enterprise-grade shared storage solution built on server node clusters replaces traditional SAN/NAS at a much lower cost. Organizations can quickly add storage capacity as needs grow over time. Support for all-flash NVMe drives delivers unrivaled performance. Hyper-Converged Infrastructure (HCI) Standard – Highly virtualized compute and storage are combined in the same server node cluster, making them easier to deploy, manage, and scale. By eliminating traditional IT compute, storage, and networking silos, you can simplify your infrastructure. Hyper-Converged Infrastructure (HCI) Premium – Comprehensive “software-defined datacenter in a box” adds Software-Defined Networking and Security Assurance features to HCI Standard. This makes it easy to scale compute, storage, and networking up and down to meet demand just like public cloud services. These three types offer different features depending on your needs. Update: If you are interested in a Windows Server based HCI solution, check out the new Azure Stack HCI.